What is one goal that motivates you? I am motivated by so many things. Lately I have felt stressed because of so many changes that are happening but I deal with the stress….I would like to think I deal with it quite well. One particular thing that has been motivating me a great deal lately is the upcoming 5k I am going to participate in on October 20th. This is my first 5k ever and I am officially registered so there is no backing out. I am not a great runner. I may have to walk some of it but I am trying my hardest to improve every single week. I have an app on my iPhone called Couch to 5k and I have made it to week 5 (it is a 9 week program). There are days I struggle more than others but my inner determination amazes me. Even through the sweat pouring down my face and the urge to throw up I tell myself over and over again that I CAN do it. 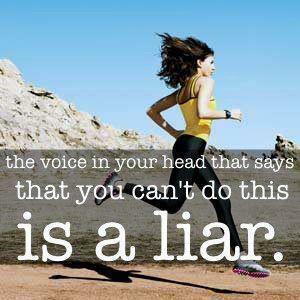 The belief that I can’t is untrue. There are times I feel like throwing in the towel because my body aches or it just feels like I don’t have the talents or skills that other people have. It isn’t about comparing myself to others though….it is knowing that even if it takes a little bit longer than some other people, I can do it! The belief that I am capable of doing anything I want is what motivates me. Wow…that must be pretty awesome 🙂 but um, how challenging are they? the places i will go with the money i will make if i ever sell books. that motivates me. thus really cool,rather than worrying over an issue!